Are you looking for the job in Mazagon Shipbuilders Limited? So, we have great news for all those candidates who are seeking for the Mazagon Dock Vacancy 2018 on the internet. Here, in this post, we are going to describe all the detailed information about the Mazagon Dock Trade Apprentice Recruitment 2018 in the following section of this post. The Interested and eligible candidates must read the complete article properly and get all the details before applying. 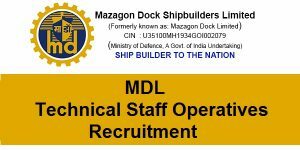 Candidates may apply online for the notification on the official website of the Mazagon Shipbuilders Limited department that is www.mazdock.com. For extra details, Competitors can check our careerjobs360 official website regularly & get all the latest updates from here and stay in touch with us for further purpose. The Mazagon Shipbuilders Limited has recently announced the official notification for the Mazagon Dock Vacancy 2018 for hiring passionate and well deserving candidates for various numbers of posts in the department. The names of the vacancies available in the organization are Technical Staff & Operatives Posts. The Mazagon Shipbuilders Limited department is searching for talented and deserving aspirants for the vacant positions. The aspirants may apply for the Mazagon Dock Trade Apprentice Recruitment 2018 through the online mode. Individuals may submit their online application form on or before the last date that is 03rd August 2018. Therefore more details about the Mazagon Dock Jobs 2018 such as Academic Qualification, Academic Qualification, Age Limitation, Age Relaxation, Application Charges, Important dates, Selection Process and the procedure to apply is given below in the article. The candidates must grab all the relevant details just by reading this post. Mazagon Dock Shipbuilders Limited formerly called as Mazagon Dock Limited is India’s prime shipyard. Mazagon Dock Shipbuilders Limited manufactures warships & submarines for the Indian Navy & offshore platforms & associated support vessels for offshore oil drilling. It also builds cargo bulk carriers, tankers, passenger ships & ferries.The Mazagon Dock Shipbuilders Limited was established in the 18th century. Eventually, ‘Mazagon Dock Limited’ was registered as a public company in the year 1934. The shipyard was nationalized in the year 1960 & is now a Public Sector Undertaking of the Govt. of India. Educational Qualification: Willing Candidates who want to apply for the Mazagon Dock Jobs 2018 they must have completed SSC or equivalent examination organized by a Board recognized by the Govt. & National Apprenticeship Certificate Exam passed in the trade of “Refrigeration and Air Conditioning”. For more about educational qualification, please refer to the official advertisement. Age Limitation : The minimum age limit for the competitors is 18 years and the maximum age limit for the competitors is 33 years. Application Fees: For General and OBC category must have to pay application fees of Rs 140/- using SBI Challan Form only and the SC/ST category are exempted from application charges. Selection Procedure: The contenders will be selected on the basis of their performance in the following selection rounds. Pay Scale: selected contenders will get a good amount of monthly salary specified by the Mazagon Dock department. For more information, aspirants can check the official notification. How to Apply for the Mazagon Dock Trade Apprentice Recruitment 2018? Interested Candidates who are willing to apply for the Mazagon Dock Technical Staff and Operatives Jobs 2018 then they must know the eligibility conditions. Those aspirants satisfy the eligibility needs then they may apply online for the recruitment from the official web portal. Participants must apply online on or before the due date that is updated soon. Here we have mentioned some simple steps to apply for the Mazagon Dock Trade Apprentice Vacancy 2018. Then, on the homepage search out the Mazagon Dock Trade Apprentice Recruitment 2018 Notification and open it in the next tab. After that, aspirants must read all the instructions from the official advertisement very carefully and then fill the application form without making any error. Now, send the print out copy of the application form on the given postal address.